Immersive theater is all the rage. And rightly so! Immersive theater offers a unique opportunity for theatermakers to create art that allows the audience to be fully engulfed in the experience, interacting in a manner that defies the fourth wall. But to pull off a feat of success takes a lot of intricate planning, impeccable timing, and an idea that is dreamily suited for the execution. In Journey Lab and Deaths Head Theatrical’s extraordinarily ambitious The Alving Estate, the company takes a piece inspired by a classic text and thrusts it into a haunted mansion in hopes of joining the ranks of other esteemed immersive companies. Sadly, that’s not quite the case. Taking inspiration from Henrik Ibsen’s Ghosts, The Alving Estate transports some key players from the story to an earlier time to create a prequel of sorts. Though, you’d likely have to dig up some information to discover that important detail of context. While it will cause some concern later, picking Ghosts as the source material is strong, especially when you have a space to stage it like the Morris-Jumel Mansion. With a captivating story to use as the backbone and a venue seemingly perfectly equipped for an immersive experience, all the important ingredients are in place so what could go wrong? The Alving Estate suffers from an exuberant amount of execution woes. And it’s unfortunate because the potential is present. Co-created, co-conceived, and co-directed by Victor Carinha, Mia Zanette, Jennifer Wilson, Liz Lehman, Christy Casey, and Anthony Logan, The Alving Estate may be an example of too many cooks. Immersive theater is all about the experience. From entering the venue to leaving the venue, every minute detail in between should be deliberate, detailed and executed precisely. One tiny flaw could alter the enter flow of the evening. Having experienced the powerhouse that is Sleep No More or not, it’s evident that The Alving Estate is trying to capitalize on the Punchdrunk model. From the intricate movement interludes to the one on one interactions to the necessity of wearing a mask, the parallels are clear. It’s always nice to be likened to something worthy but if you don’t match or exceed the comparison, audiences are likely to say the other did it better. Comparisons aside, what was offered didn’t quite hit the mark. Without spoiling the experience entirely, there are some key factors to consider. Staging the piece in January in New York City has some risk attached but the evening begins as you find house attendants hopefully waiting for you at the gates of the mansion to check you in. But you have to wait until a large enough group arrives before you can find warm refuge inside. Once inside, drinks are offered and you have an opportunity, if you so chose, to mingle with your fellow anxious colleagues. When all have gathered, the experience officially begins. Drunkard Jakob Engstrand meanders to the basement quarters to set the scene. We, the audience, are present for a job interview. 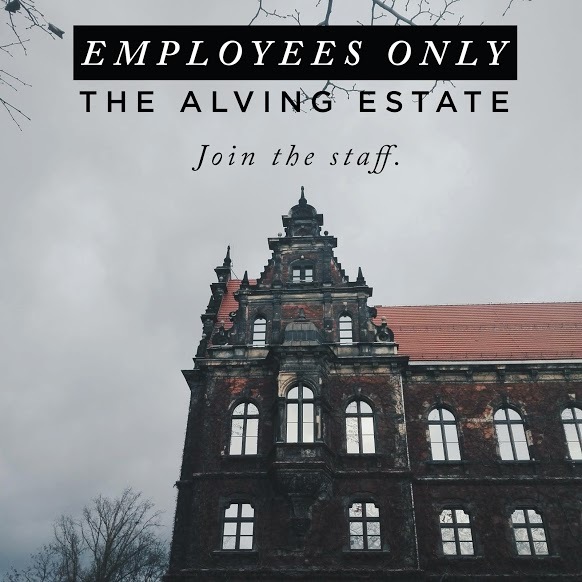 We’re advised to pay close attention to the staff and explore the Alving Estate. In groups, you’re guided upstairs to collect a pair of white gloves and a surgical mask to wear as you explore. And thus begins a series of whys. From a dramaturgical perspective, establishing the experience as a job interview is interesting but it doesn’t quite get fully realized. You never quite get evaluated. Rather you watch the current help fight the ghosts within themselves, each searching for an escape from the retched job. The white gloves are a clever choice as it is a means to keep the estate clean if you wish to touch anything. But the surgical mask? It ends up feeling like they’re only used because Sleep No More has their audience wear masks. It becomes even more problematic from a dramaturgical perspective because if we’re perspective help, why isn’t the current help wearing the masks as well? With gloves and masks on, Regina Engstrand, daughter of Jakob and lead maid of Mrs. Alving, allows you to explore the estate. And thus, the immersive experience officially begins. You fend for yourself and follow your favorites. The Morris-Jumel Mansion is a multi-story house with an array of rooms filled with history. But ignore the Morris-Jumel memorabilia as it has nothing to do with the storytelling. It’s likely in your long beats of downtime you’ll read up on Aaron Burr and the other original residents of the home. Each room starts with the help engaging in lyrical movement where you may or may not be interacted with. What do these people’s stories have to do with the larger picture? That’s a big question mark. Until each person has their opportunity to journey from room to room does the Ibsen-inspired story begin. You discover Helene Alving preparing for the launch of a party where an announcement that an orphanage in her deceased husband’s name is to be built. As time passes, Pastor Manders arrives disparaging of her. And then her son Oswald suddenly returns home where he engages in a flirtatious affair with Regina. Knowledge of the source material is nearly essential to comprehend the character relationships, especially when the interactions begin. Unlike Sleep No More, The Alving Estate relies on dialogue. But the main problem is there is not enough content to keep the evening moving. There is so much individualized/slightly choreographed moments to fill the dead beats. The Alving Estate needs to either have less time in between beats or once the dialogue starts, it never stops, continually moving from moment to moment. With a source material that may not be as well known, missing any of the scenes is detrimental. Perhaps a stronger solution of the night was utilize the help in a manner where they guide the audience to the scenes so no one misses anything. But that means cueing and timing has to be exact. With haphazard rules set, yes, everyone’s experience will be different, but it may be a detriment for this particular piece. And with only five key players to follow, there’s only so many places you can go. It’s likely you may end up filling the time void by walking in circles and seeing repetitious scenes. 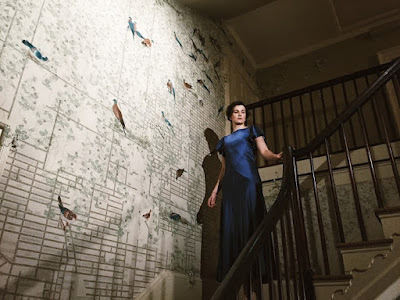 The evening virtually ends with a dynamic scene of foreshadowing, but not knowing the source material and the true nature of Regina and Oswald, the scene lacks nearly all of its gravitas. From there, the guests are guided back to the basement, but who gets the job, since that’s the premise of the night? Well rumor had that there is an extra special scene that involved one audience member and the entirety of the company that seems to lack purpose in context, especially if you’re not in the room where it happened. From a design perspective, much credit is due when it comes to the ambiance. The lights and sound add a dynamic layer, transforming the space into something spooky. And with experience being an essential element, the mode that was evoked was successful. Textually, the script is transported to the 1950s. But only one actor, Michael DeBartolo, truly captures the essence of the period. The rest of the company lived in a more heightened Ibsen-esque cadence. And it didn’t quite work. The bond between DeBartolo’s Oswald and Regina, played by Sandra Glinka, was the most interesting story to follow. Especially if you know what's to come in Ghosts. And we’re only given limited moments between the two. Phoebe Dunn took on the role of Helene. Dunn has a mesmerizing presence but age was a factor in believability. Evan Shaw as Pastor Manders spent most of his evening with Helene. Shaw offered a pensive performance, almost lost in the mansion like the guests. Sadly for Andrew Hamling, he was seldom utilized. But when Hamling appeared, he created a strong and interesting character. Credit should be given to the ensemble of "help" as they fill time and space, crafting a story that, at times, is more interesting than the text itself. With an audience unsure of where and when exactly to journey, The Alving Estate is a choose-your-own-adventure that wasn’t fully realized. For those who can’t quite afford Sleep No More, The Alving Estate is a viable option. Just don’t quite expect the grandeur of Punchdrunk.